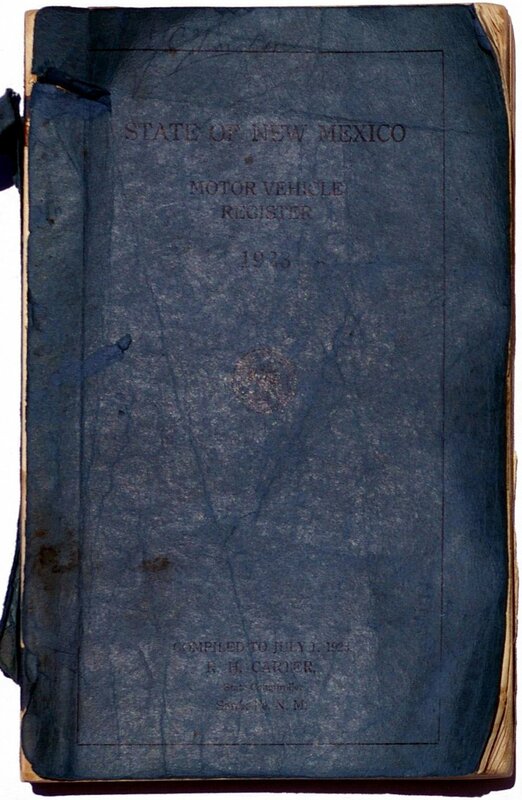 New Mexico’s motor vehicle registrations were recorded with pen and ink in large ledger books during the years 1912 through 1916. By at least 1918 they were being published in book form so that they could be provided to law enforcement officials, and by 1932 there were so many vehicles in the state that the registration records took up multiple volumes each year. 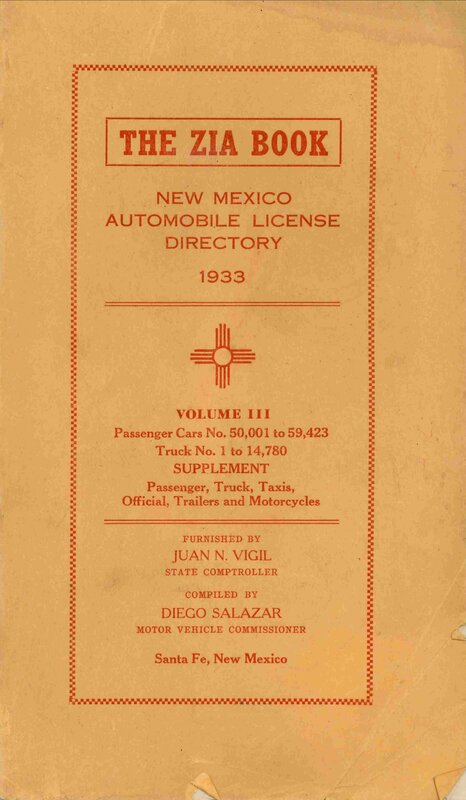 These were published under various names, including New Mexico Automobile Record, New Mexico Motor Vehicle Register, New Mexico Automobile License Directory, and The Zia Book, to name a few. Unfortunately, the records have not survived for all years, and the New Mexico Transportation History Project continues to seek copies of all such records for our archives. If you have any of these books that you would like to donate or sell to the NMTHP, please contact us. Scroll down for a complete index of all known surviving New Mexico motor vehicle registration records. 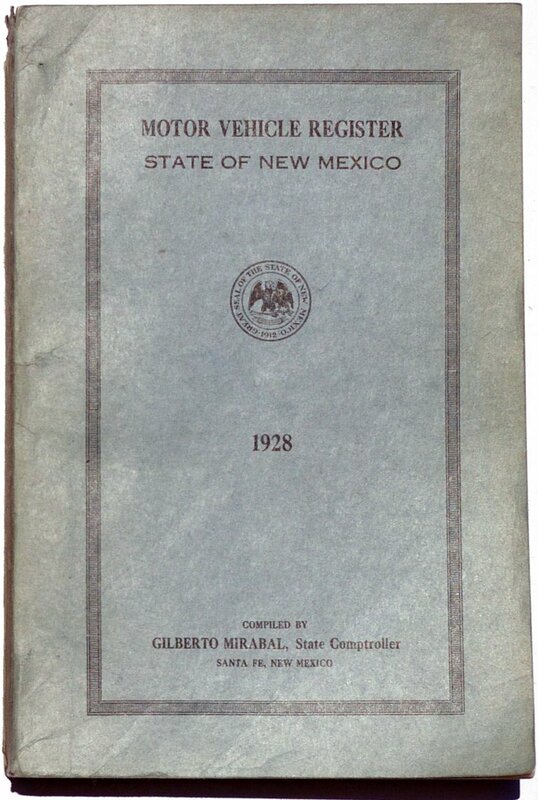 The New Mexico Transportation History Project has spent more than thirty years and a considerable amount of money locating and obtaining copies of all known surviving New Mexico motor vehicle registration records. In recent years a great deal of time and expense have also been invested in digitizing these records, a project which was completed in 2017. Consequently, the NMTHP archives now contain both paper and electronic copies of all known registrations. Below you will find a complete index of these records. Any that are not explicitly listed in the index have not been found and we have no information on them. Please note that at the present time the NMTHP does not have personnel resources to honor requests to look up specific registration information, but it is the goal of the organization to be able to do so in the future. We will make an appropriate announcement when that time comes. Meanwhile, we continue to seek additional records. If you have any New Mexico registration books or records that you would like to donate or sell to the NMTHP, regardless of whether or not they are listed below, please Contact Us. 1912 All plates. These were numbered 1 to 904, which includes both Cars and Trucks. 1913 Regular plates: All that were issued. These were numbered 905 to 1998, which includes both Cars and Trucks. Dealers: All. Numbered 1 to 23. Motorcycles: All. Numbered 1 to 177. 1914 Regular plates: All that were issued. These were numbered 1 to 3090, which includes all Cars and Trucks. Dealers: All. Numbered 24 to 102. Motorcycles: All. Numbered 1 to 179. 1915 Regular plates: All that were issued. These were numbered 1 to 5000, which includes all Cars and Trucks. Dealers: All. Numbered 1 to 80. Motorcycles: All. Numbered 1 to 376. 1916 Regular plates: All that were issued. These were numbered 1 to 8228, which includes Cars and Trucks. Dealers: All. Numbered 1 to 128. Motorcycles: All. Numbered 1 to 364. 1917 There are no known surviving records for this year. 1918 Regular plates: All that were issued from the beginning of the year to May 8, 1918. This includes plates 1 to 15000, and includes both Cars and Trucks. 1919 There are no known surviving records for this year. 1920 Regular plates: All that were issued from the beginning of the year to May 15, 1920. This includes plates 1 to 18000, and includes both Cars and Trucks as both received the same type of plate. Plates issued after May 15, i.e., numbers 18001 to approximately 22070, which were renewed in 1923 can be found in the 1923 records (applies to Motorcycle and Dealer plates as well). Dealers: Numbered 1 to 143. Motorcycles: Numbered 1 to 161. 1921 There are no known surviving records for this year. However, a 1921 plate that was renewed in 1923 can be found in the 1923 records (applies to Motorcycle and Dealer plates as well). 1922 Regular plates: New-issue plates that were issued from roughly the middle of the year to the end of the year, and includes both Cars and Trucks, as both received the same type of license plate. These are numbered from 33001 to 37411, and include both Cars and Trucks, as both received the same type of license plate. Plates issued earlier in the year that were renewed in 1923 can be found in the 1923 records (applies to Motorcycle and Dealer plates as well). 1923 Regular plates: All plates issued from the beginning of the year to July 1, 1923. These are numbered 37412 to 45899, and include both Cars and Trucks, as both received the same type of license plate. All plates originally issued in 1920, 1921, and 1922 that were renewed in 1923 by July 1 are also included. This includes seal (tab) numbers 1 to 17999. Since renewals had to be accomplished very early in the year, essentially all 1923 renewals are included. Dealers: Numbered 1 to 261. Includes plates from 1920 through 1922 that were renewed in 1923, but those which were not renewed in 1923 are omitted. Motorcycles: Numbered 2 to 451. Includes plates from 1920 through 1922 that were renewed in 1923, but those which were not renewed in 1923 are omitted. 1924 Regular plates: All issued from the beginning of the year to June 1, 1924. This includes plates 1 to 33000, which includes both Cars and Trucks, as they received the same type of plate. Commercial Cars: Plates issued from the beginning of the year to June 1, 1924. This includes plates 1 to 422. Commercial Trucks: Plates issued from the beginning of the year to June 1, 1924. This includes plates 1 to 880. Dealers: Plates issued from the beginning of the year to June 1, 1924. This includes plates 1 to 88. Motor Trucks: Plates issued from the beginning of the year to June 1, 1924. This includes plates 1 to 103. Motorcycles: Plates issued from the beginning of the year to June 1, 1924. This includes plates 1 to 178. 1925 There are no known surviving records for this year. Regular plates: Numbered 1 to 50900, which includes both Cars and Trucks, as they received the same type of plates. Commercial Cars and Trucks: Numbered 1 to 2100. Motor Trucks: Numbered 1 to 99. Motorcycles: Numbered 1 to 163. Regular plates: Numbered 1 to 54604, which includes both Cars and Trucks, as they received the same type of plates. Commercial Cars and Trucks: Numbered 1 to 1559. Motor Trucks: Numbered 1 to 134. Motorcycles: Numbered 1 to 176. Trailers: Numbered 1 to 131. Regular plates: Numbered 1 to 64500, which includes both Cars and Trucks, as they received the same type of plates. Motor Trucks: Numbered 1 to 201. Motorcycles: Numbered 1 to 172, plus 245, 250, and 263. 1929 There are no known surviving records for this year. 1930 There are no known surviving records for this year. Cars: Numbered 1 to 56900. Trucks: Numbered 1 to 15199. Commercial (Taxi, Bus, Driverless): Numbered 1 to 299. Driverless (in addition to above): Approximately 37 plates within the range 38852 to 69547 were also issued to Driverless cars. Highway Department: Numbered 1 to 499. Motorcycles: Numbered 1 to 199. Official: Numbered 1 to 399. Staff Officer: Numbered X-1 to X-99. Trailer: Numbered 1 to 699. U.S. Official: Numbered 1 to 199. Cars: Numbered 1 to 25000. Cars: Numbered 0 to 25000 and 50001 to 59423. Trucks: Numbered 1 to 15550. Dealers (new car): Numbered D-1 to D-99. Motorcycles: Numbered 1 to 225. Non-Passenger (other): Available for most other types, including Commercial (Bus, Taxi, Driverless), Dealer (used car), Governor, Lt. Governor, Highway Department, National Guard Officer, Official, U.S. Official, Staff Officer, and Trailer). Cars: Numbered 0 to 64400. Trucks: Numbered 1 to 15000. Dealers: Numbered D-1 to D-108. Motorcycles: Numbered 1 to 252. Cars: Numbered 25001 to 73873. Trucks: Numbered 5001 to 19000. Dealers: Numbered D-1 to D-125. Motorcycles: Numbered 1 to 284. Cars: Numbered 30001 to 80000. Trucks: Numbered 5001 to 21000. Motorcycles: Numbered 1 to 314. Dealers: Numbered D-1 to D-150. Cars: Numbered 60001 to 89582. Trucks: Numbered 15001 to 26000. Motorcycles: Numbered 1 to 342. Dealers: Numbered D-1 to D-154. Non-Passenger (other): Available for most other types, including Commercial (Bus, Taxi, Driverless), Dealer (used car), Governor, Lt. Governor, Highway Department, National Guard Officer, Official, U.S. Official, Salesman, Staff Officer, and Trailer). Cars: Numbered 0 to 89710. Trucks: Numbered 1 to 28176. Motorcycles: Numbered 1 to 331. 1939- Present There are no known surviving records for any of these years.